These wooden Irish nutcrackers and leprechaun nutcrackers are great for Christmas display and will be an enjoyable addition to any collection. 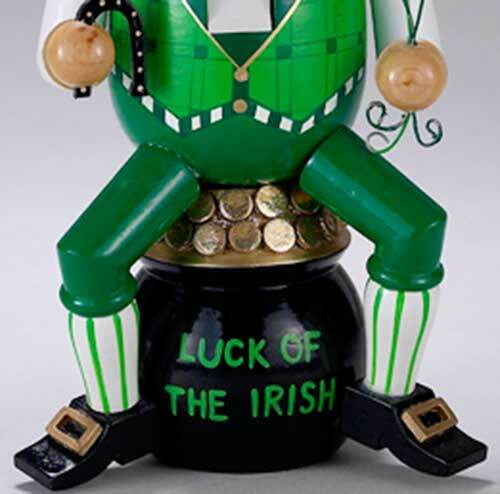 Many of our Irish nutcrackers have similar characteristics of the leprechaun including their green outfits, the pots of gold and the abundance of shamrocks. 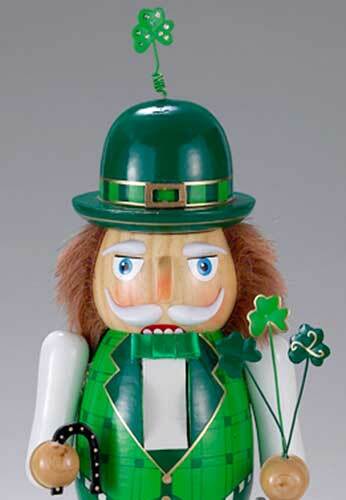 Irish nutcracker features a leprechaun sitting on a pot of gold. In addition to our Irish nutcrackers, The Irish Gift House has additional selections of Christmas figurines; our most popular categories are the Irish angel tree toppers and the Irish Santa figurines. Most of the angels illuminate and will cast a heavenly glow from on high or from any flat surface where they may be displayed as centerpieces. From our Santa collection you may select from musical and occupational designs that include the policeman Santa and fireman Santa. You may also wish to look at our cute Irish snowmen and because they don't melt, you may display them all year long.